Since this was shown on TV in a two hour block, a few of the matches will be clipped. We kick off the show with two younger wrestlers, particularly the rookie Yamagata. Fujita had a short career from 1998 to 2004, only having title success in ARSION. Yamagata debuted for ARSION in December 2000 and has enjoyed a long and successful career since then, as she is currently one of the biggest stars in Pro Wrestling WAVE. 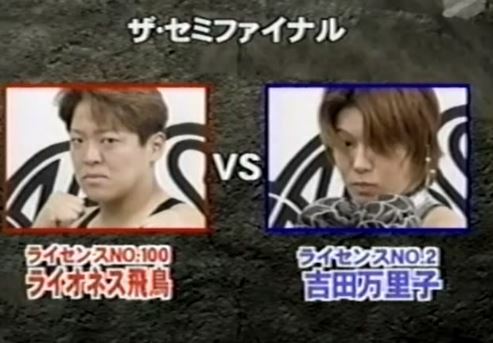 Of course back in 2001, the high flier Fujita held seniority over the rookie, as Yamagata was still learning her craft. We join in progress as Fujita scoop slams Yamagata before putting her in a crab hold. Yamagata makes it to the ropes, Irish whip by Fujita and she delivers a dropkick for a two count. Fujita keeps it on the mat as she applies a sleeper, but Yamagata gets a foot on the ropes. Yamagata fights back with a pair of dropkicks but Fujita rocks her with an elbow and ducks Yamagata’s crossbody attempt. Fujita throws Yamagata in the corner and hits a Space Rolling Avalanche, standing moonsault by Fujita but it only gets two. Jumping lariat by Fujita, she picks up Yamagata but Yamagata rebounds out of the corner with a triple jump crossbody. Fujita levels her with another elbow, she goes up top and hits a missile dropkick for two. Fujita picks up Yamagata and hits a release German, she goes up to the top turnbuckle and nails the moonsault for the three count! Fujita is your winner. A short match clipped shorter, but not a bad opener. Yamagata showed flashes of ability, just from this I wouldn’t have known she’d be as good as she ended up being but I am not surprised either. Fujita was known for her high flying offense, she mostly stayed grounded here however she did hit a nice looking moonsault. Decent showcase for both wrestlers. More young wrestlers! Faby Apache is a popular luchadora that currently wrestles in AAA, she is a multi-time champion in AAA but was trained partially in ARSION. ASARI retired in 2003, she was a multi-time Jr. Heavyweight Champion during AJW’s heyday and was known for her Sky Twister Press. Rena Takase is better known today as Leon, she currently wrestles in JWP and has had a long successful career. Here however she was just one year into her career and still learning. Finally, Tamada debuted in AJW in 1991 and held the AJW Championship, making her perhaps the most successful wrestler of the bunch at the time of the match. This match is also joined in progress, with Tamada in the ring with Faby. Takase randomly runs in and spears Faby but Faby avoids Tamada’s missile dropkick. Faby tags in ASARI but Tamada catches her with a Stunner, Tamada goes off the ropes but ASARI pushes her out of the ring. ASARI then goes up top and sails out of the ring down onto both Tamada and Takase, they return to the ring and both ASARI and Faby hit missile dropkicks. Tamada blocks a Northern Lights Suplex but Faby lariats Tamada, helping ASARI hit the move. Frankensteiner by ASARI to Tamada, but the cover gets two. ASARI goes up top but Tamada grabs her from behind and throws ASARI to the mat. German suplex by ASARI but Tamada is back up and hits a roaring elbow. That gives her time to tag in Takase while Faby is tagged in as well, and Faby puts Takase in a Mexican Surfboard. Tamada helps from the apron which allows Takase to apply a quick cross armbreaker, but Faby gets a toe on the ropes. Takase knocks Faby out of the ring, she then goes up top and dives out of the ring onto ASARI and Faby. 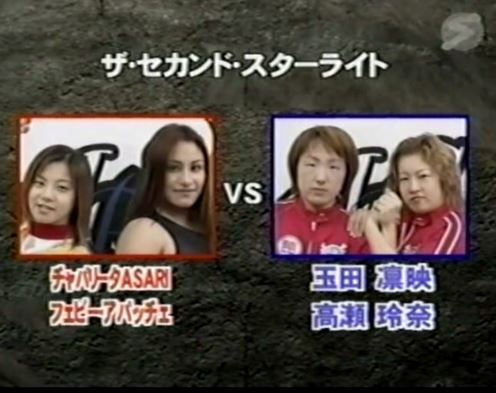 Takase gets a chair but the referee tries to get it from her, while the referee is distracted Tamada grabs another chair and whacks Faby with it. Tamada then sets up Faby near the ropes and props the chair against her before hitting a dropkick into the chair from the top turnbuckle. Takase grabs Faby and hits a German suplex hold, but Faby barely kicks out. Takase goes up top but hits a crossbody on Tamada on accident, Faby goes off the ropes but Tamada trips her from the apron. Faby recovers and hits a jumping heel kick on Takase, she goes up top but Takase avoids the diving headbutt. Missile dropkick by Tamada, Takase goes up top and hits a diving crossbody for two. Takase goes off the ropes but Faby levels her with a lariat, Takase sneaks in a backslide but Faby hits another heel kick. Liger Bomb by Faby, and she gets the three count! ASARI and Faby Apache win the match. I continue to be introduced to new wrestlers, as today I get to meet Bionic J. Bionic J (also known as Jessie Bennett as she was trained by Reggie Bennett) debuted in 1995 and was a power wrestler. She never won any titles however and faded away after ARSION closed up in 2003. GAMI is a bit more well known, as while she is retired now, she is the founder of Pro Wrestling WAVE and wrestled successfully there for many years. A strength vs. strength match-up with two ARSION mainstays. As we join the match, Bionic J is kneeing GAMI, Irish whip by Bionic J and she hits GAMI in the stomach with a nunchuck. GAMI takes it from her but Bionic J delivers a superkick, she goes for a shoulder tackle but GAMI catches her with a guillotine. GAMI gets Bionic J to the mat but she gets into the ropes, GAMI puts Bionic J on the top turnbuckle and she hits a Frankensteiner, but Bionic jumps to her feet and hits a lariat. Cutter by Bionic J but GAMI bounces up from that and hits a lariat followed by a STO. GAMI goes up top and hits a diving elbow drop, picking up a two count. Chokeslam by Bionic J and she applies a Texas Cloverleaf, but GAMI gets into the ropes. Bionic J throws GAMI into the corner but GAMI drop toeholds her when she charges in and kicks her in the face. GAMI goes for a pump handle but Bionic J blocks it and hits a double underhook facebuster. Bionic J gets on the second turnbuckle but GAMI avoids the diving leg drop and hits a lariat. Pump handle sitout slam by GAMI, but Bionic J kicks out of the cover. GAMI punches Bionic J in the face and puts her in a cross necklock, forcing Bionic J to submit! GAMI is your winner. Not a whole lot to this one, some good power moves by both but also some random no-selling that didn’t really add anything to the match. It wasn’t a bad watch, as long as you don’t mind some of the more silly aspects of ‘fighting spirit’ cropping up. This match is for the TWINSTAR OF ARSION Championship. An unusual pairing, as LCO (Las Cachorras Orientales) is one of the best tag teams of this era while PIKA and POKO are literally clowns. PIKA is Command Bolshoi, I had no luck finding who was playing POKO and there is a third clown around as well. I will openly admit that I will mix up the clown names, the match is clipped anyway so it may swap around and even though they don’t look exactly the same it is close enough that it will be confusing. So that is my introduction, a near legendary tag team versus a few clowns in a heavily clipped match. PIKA and POKO start off with the advantage as they hit dives out of the ring, but one backfires as one of the clowns takes out the other clowns. Shimoda stays in the ring with with, we’ll say PIKA, and pokes her in the eyes, but the other two clowns come in the ring and confuse Shimoda on which one she had really poked in the eyes. Frankensteiner by POKO, then PIKA hits a sunset flip for a two count. PIKA goes for lariats and finally knocks Shimoda over, sunset flip by PIKA and she rolls her around the ring for a two count. Shimoda gets on the top turnbuckle but PIKA avoids her somersault and applies La Magistral for a two count. PIKA goes up top but Shimoda avoids the moonsault, kick by Shimoda and she covers PIKA for two. Shimoda tags in Mita but PIKA rolls her up for two. She gets on the top turnbuckle and hits a cannonball, picking up two again. She goes for another dive but Mita gets her feet up. POKO comes in the ring and distracts Mita, missile dropkick by… PIKA we will say but Mita hits a double chop to the chest. All three clowns pick up Mita but Mita gets out of it, La Magistral by… POKO but it gets a two count. Shimoda comes off the top with a double missile dropkick, Mita picks up POKO and hits a folding powerbomb for two. Mita goes for a powerbomb but she gets hit in the head with a fan, POKO goes for a hurricanrana but Mita blocks it and hits a Death Valley Bomb for the three count! LCO retain their championship. This was a really odd way to use LCO. LCO are known for being brutal (they were generally heels) but here they are doing shtick. Not being overly cooperative but they still had to take part in it. A few cute spots but I can’t say I enjoyed it as I’d much rather see LCO in a real tag match and keep the clowning around more towards the bottom of the card. Not a good match at all. Finally we are to the good stuff. A fair amount of backstory to this one. 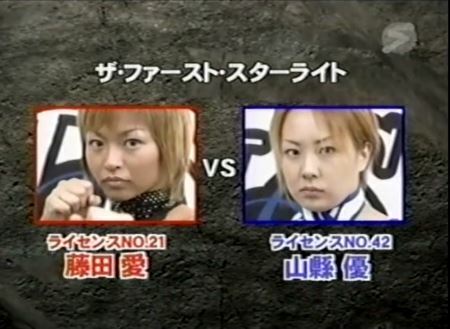 This was Asuka’s first match in ARSION, as she took over booking the promotion after Aja Kong left. When she came to ARSION, Mariko Yoshida was the first to challenge her, being one of the biggest and highest ranked veterans in the promotion. So Asuka is not easing herself in, as she looks to show she belongs in ARSION by taking down one of their best wrestlers. They jockey for position to start and end up on the mat, but after a moment they return to their feet. They return to the mat with Asuka on top, Yoshida goes for a triangle choke but Asuka gets out of it and they end up in the ropes. Yoshida goes for a cross armbreaker but Asuka blocks it and gets back up before kicking Yoshida. Asuka baseball slides Yoshida in the leg and drags her out of the ring, throwing Yoshida into a row of chairs forcefully. She goes for a suplex on the floor but Yoshida lands her her feet, snapmare by Asuka and she kicks Yoshida in the back. Asuka slides a table in the ring and then slides Yoshida back in as well, kicks by Asuka and she slaps Yoshida in the face. Asuka slams Yoshida into the table, she then puts the table across Yoshida’s chest and hits a footstomp off the top turnbuckle onto it. Liger Bomb by Asuka, but Yoshida barely gets her shoulder up. Asuka goes for a high kick but Yoshida catches her foot and applies an ankle hold, she then grabs Asuka around the neck before applying a cross armbreaker. Asuka gets into the ropes, Yoshida picks her up but Asuka hits a lariat. Yoshida comes back with a German suplex but Asuka blocks the Spider Twist, Yoshida gets the triangle choke locked in but Asuka powerbombs out of it. Asuka gets on the top turnbuckle but jumps back off and stomps Yoshida, she goes up again but Yoshida punches her and joins Asuka up top. Superplex by Yoshida but Asuka hits a quick Blue Thunder Driver. Yoshida comes back and drops Asuka with the Air Raid Crash, but Asuka kicks out of the pin attempt. Cross armbreaker by Yoshida but Asuka gets a foot on the ropes, Yoshida hits another Air Raid Crash but again it gets a two count. Yoshida goes off the ropes but Asuka delivers a high kick, Asuka goes to pick up Yoshida but Yoshida slaps her in an armtrap crossface. La Magistral by Yoshida into the Spider Twist, but Asuka inches to the ropes to force the break. Yoshida goes for another Air Raid Crash but Asuka blocks it and hits the Towerhacker Bomb for a two count. Asuka slides Yoshida out of the ring and throws her into the crowd, she removes the mat at ringside and sets up her table. Asuka puts Yoshida on the table and goes up top, hitting a footstomp down to the floor and through the table. Yoshida is quickly slid back into the ring, Liger Bomb by Asuka but Yoshida barely gets a shoulder up. Heel kick by Asuka, she picks up Yoshida and drops her with the LSD II for the three count! Lioness Asuka is the winner! This match is for the QUEEN OF ARSION Championship. Of these two, you are probably more familar with Ayako Hamada, but back in 2001 they were two of the brightest stars in ARSION. Omukai debuted in AJW in 1992 and continued wrestling until 2007, enjoying a solid 15 year career that saw her win several titles mostly in the tag team ranks. Hamada is the daughter of Gran Hamada, she is the current Pro Wrestling WAVE Ace and in 2001 was seen as the top young wrestler to begin her career in ARSION. 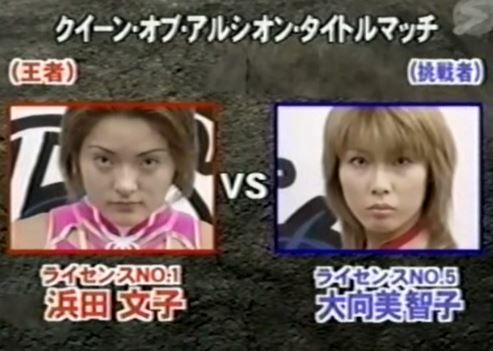 Hamada defeated Aja Kong on December 3rd, 2000 to win the title (not long before Kong left the promotion), and last successfully defended the title against Mariko Yoshida in April. Omukai dropkicks Hamada instead of shaking hands as they start with a bang, Hamada tosses Omukai out of the ring and then sails out onto her with an Asai Moonsault, but Omukai hits her with a chair as she jumps out. Hamada gets the chair from Omukai and hits her with it, Hamada slides Omukai back in the ring and she hits a swandive missile dropkick. Springboard crossbody by Hamada but Omukai rocks her with an elbow, Hamada elbows Omukai back and they exchange hard strikes. They finally slow down as Hamada hits a vertical suplex and she puts Omukai in a modified cloverleaf, but Omukai gets out of it and hits an armdrag. She applies a submission but Hamada gets to the ropes, kicks by Omukai to the head of Hamada and she hits a palm thrust to send Hamada to the mat. Omukai pounds on Hamada’s face in the mount position, busting open Hamada in the process. Omukai focuses on Hamada’s bleeding head, she goes for a powerbomb but Hamada pushes her off. Suplex by Omukai but Hamada headbutts her, more headbutts by Hamada and she hits mounted headbutts until Omukai is bleeding too. Omukai is bleeding everywhere as they trade headbutts, hard elbow by Omukai and she covers Hamada for two. Hamada puts Omukai in an Octopus Hold, she takes it to the mat but Omukai gets a foot on the ropes. Bodyscissors into a submission by Hamada and they trade submissions until Omukai gets to the ropes. Hamada goes for a powerbomb, Omukai blocks it and goes for a cross armbreaker, but Hamada blocks that and puts Omukai on the top turnbuckle. Hamada then joins her and hits a face crusher to the mat, cover by Hamada but it gets two. Hamada charges Omukai but Omukai catches her in a triangle choke, Hamada struggles but manages to make it to the ropes. Omukai picks up Hamada but Hamada slides away and hits a palm strike. Shining Kick by Omukai, she covers Hamada but Hamada gets a foot on the ropes. Spinning backfists by Omukai but Hamada ducks one and slaps her. Spiral Bomb by Hamada, but Omukai barely gets a shoulder up on the cover. Jumping heel kick by Hamada, and she picks up the three count! Your winner and still champion: Ayako Hamada! I was not sure what to expect from this show but the last two matches really made the event worth watching. The first half of the card was pretty clipped, and while the Faby tag match was solid the LCO tag match was quite bad. Asuka/Yoshida was great, a bit poorly structured but still a really fun watch. But the main event caught me off guard, I’d never have thought going in that I’d enjoy it more than Asuka/Yoshida but they really hooked me in and had me on the edge of my seat with the slick submissions and hard strikes. And the blood, everyone knows I love a good bloody match. 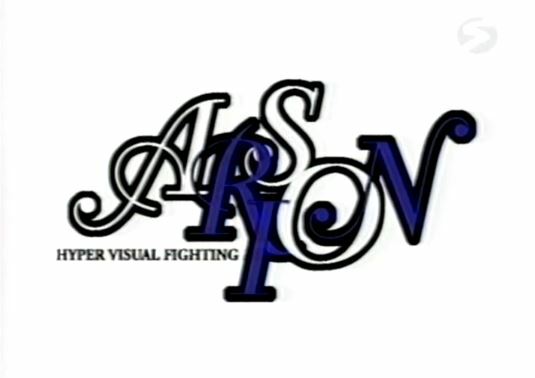 So while the undercard was lacking a bit, check out the last two matches for sure, overall a solid event from ARSION.